American drivers continue to rely on earth-friendly and engine-smart E15 to fuel their lives. 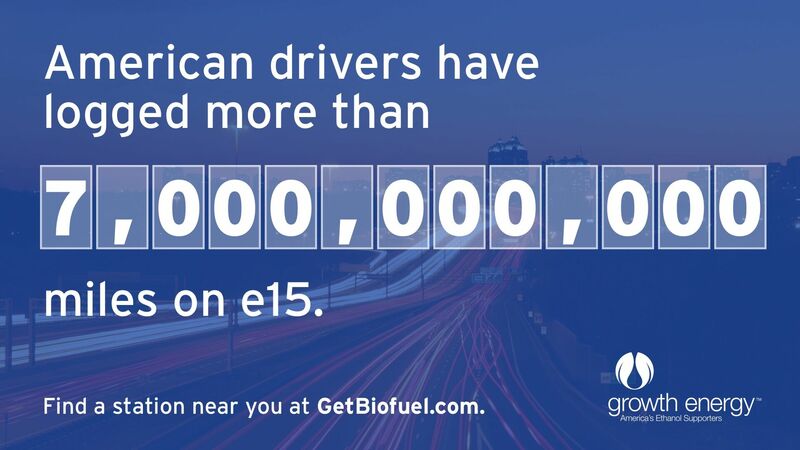 Consumers across the U.S. have logged a total of 7 billion miles on the fuel and shown the resounding success of E15, a fuel blend that contains 15 percent ethanol. E15, which is sold as Unleaded88 or Regular88 at most retail locations, is a win for anyone looking for a better choice for the environment and their engines. This renewable fuel burns cleaner and cooler than regular gasoline, and saves drivers up to 10 cents on average per gallon with each trip to the pump. Today, major retailers like Kwik Trip, Sheetz, Casey’s, Cumberland Farms, Thorntons, Kum & Go, RaceTrac, QuikTrip, Rutter’s, Minnoco, Protec Fuel, Murphy USA, and Family Express offer E15 at more than 1,700 stations across 30 states, and that number will continue to grow. Share your photos of fueling up with E15 with us using the #NextBillion hashtag on social media! For more information, please contact Director of Communications Majda Olson.